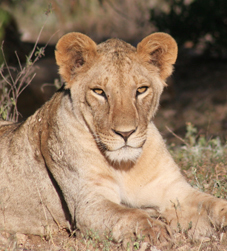 The most urgent threat to lions today is the widespread use of poison in retaliation for depredation on livestock. When lions or hyenas kill a large animal like a cow, they eat part of it and return the next night to finish the carcass. Livestock owners have learned that the universally available agricultural pesticide carbofuran (marketed as Furadan) is lethal to predators – they need only sprinkle a few cents worth of carbofuran on the carcass and any mammal or bird which feeds on it will die. 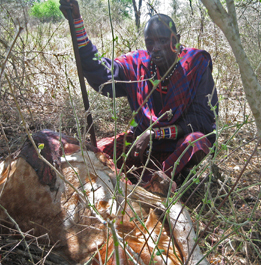 This cow (right), found by one of LWL's Lion Guardians, was killed by lions and partially eaten. They returned to the carcass the next night, providing an easy opportunity for a potential lion poisoner. LWL has evidence of over 50 lions poisoned in just our Laikipia study area, and at least 68 in our Kilimanjaro study area since 2001, sometimes whole prides at once. These are a small fraction of the predators actually killed by poison, because in the vast expanse of African rangelands, relatively few come to the attention of researchers or authorities. We frequently learn of a poisoning when we find one of our collared lions dead, such as this one on the left. The animals are invariably found next to a poisoned livestock carcass. 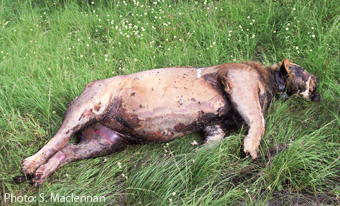 Richard Bonham’s evidence of large scale lion and hyena poisoning in 2001-2 motivated the establishment of his Predator Compensation Fund and LWL's Kilimanjaro Lion Conservation Project. Carbofuran, which is banned in the US and Europe because of its lethal effects on wildlife, has been removed from the market in Kenya, but secret stocks still exist and are still being used to poison predators. It is still universally available in shops throughout Uganda and Tanzania, where $1.50 they will buy enough American-manufactured Furadan to kill dozens of lions and hyenas. 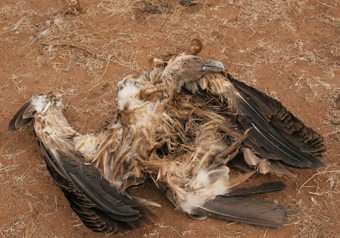 Although poisoned predators are rarely found by conservationists, a more visible effect of predator poisoning is the disappearance of vultures and some species of eagles from the skies of Kenya. These also feed on poison-laced livestock carcasses or the bodies of dead predators, and are also killed in large numbers. Some vulture species have become nearly extinct in Kenya and others have been severely reduced. Elsewhere, carbofuran is used for poisoning fish and waterfowl for human consumption, and crocodiles for their skins. In the short term, Kenya must ban the importation and sale of carbofuran and replace its legitimate agricultural use with other pesticides which cannot be abused to kill wildlife. However, in the long term, we must find ways to make predators more valuable to the rural people who share the land with wildlife. So long as wild animals are regarded by people as an expensive nuisance rather than a valuable resource, wildlife in Africa will continue to decline, eaten as cheap bush meat, poisoned and speared as pests. In a world increasingly dominated by humans, crops and livestock, all Living with Lions programs are focused on this one ultimate challenge to conservation.